The human resources team can be one which assist you to become a good manager, deal with any issues such as lawsuit, and even get promoted. But it is mandatory to remember that there are few aspects which must not be shared with the HR management. They are considered as one of the great people to know, they are ones who hook employees at times of employee assistant programs. They are ones who help you with any kind of paper work which is required. With all these positive aspects, the employees must also bear in mind that the HR’s are the first ones who were employed for the company. The real fact is that they would help you out only as employees who do good to the organization. 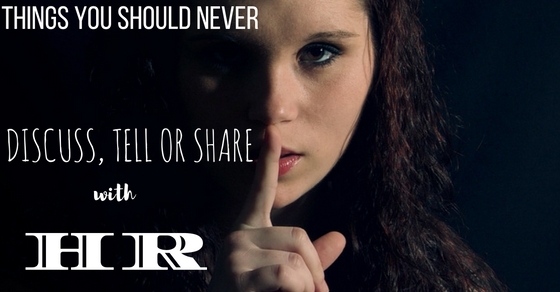 Hence here are a few things you should never tell or share with HR. It is always advised not to share about any illegal activities that you have participated in, though it may have happened outside the organization. It would be really compelling for the HR to do something or say something about the activity. They may find it tough to make a decision to report the employee to the police. Though the issue the employee created is not going to initiate any problem in their happy bells, they are concerned about it a lot. Such sharing about illegal activities would affect you as well as your organization too. The usual dilemma with women is that they think to stay back at home as a mom which would be the best role for their life to balance after a new baby has arrived. It is advised not to share such thoughts at times of FLMA leave. When such sharing occurs then the employee can be reassigned to a new role and their former role can be hired for some other employee. There may be a dilemma and women employee may make up their mind later on, hence sharing prior proper decision is not advised and can turn into adverse effects. It is mandatory not to give them opportunity to make decisions which can turn into adverse effects for the employees. Employees look for favorable treatment, privileges from organizations which isn’t true and they also require time off. A simple example is when any employee lies to the HR that they require time off for the death and funeral of his mother/grandmother who actually aren’t dead. Time passes by and the employee was committed in the job by the employer. There comes a situation where his mother was ill and required help but he cannot ask for time off to help his mother as he could get under trouble. He would be in an unfortunate position if he confessed his lies, and as per company policies he would be terminated. Hence it is important to speak the truth and take time off for the right reasons. There would be serious adverse effects and also termination when employees print untruthful statements on their resumes. Claiming irrelevant information on the resume which isn’t true can lead to job termination as the company policy mentions that untruthful statements can result in termination. Though you don’t decide to work for the upcoming years with your HR and cover all the lies, but never tell the HR that you did. It is always advised not to tell the HR about the second job that you’re working on. This is because the HR thinks about the employee’s commitment to the organization and present job. The HR may conclude that you have set out for a second job since the organization has not paid you well or the employee may have required additional challenges. Since the matter is brought to the HR attention, they start researching by asking the employee so that they can offer something for the employee. By sharing such thoughts the HR team holds the employee and they do not gain opportunities in the current workplace. Also if there are any issues that take place in the work such as missing meetings, arriving late, missing work and more, they blame the second job for all these activities. When something illegal is happening in the organization for example when an employee is assaulted or harassed then it would not be confidential and remain silent. This is because there is a legal requirement and the HR would report for such issues. It is also important to remember that whatever you tell your HR would surely reach your boss. HR’s are ones who work amongst management and employees and they are supposed to act on serious issues whether the employees wants or not. It is advised not to discuss about romantic and love relationships that happen in the office to the HR. This is especially important for the ones who have relationships within the office environment. The business insider survey made a report which mentioned that about 2300 respondents (92%) mentioned that they should not notify the HR and about 80% mentioned that it is ok to share and continue these. It is always good that your work isn’t judged by office love and your mistakes are not outlined by your romantic abilities. An employee may have good reasons for filing a complaint legally with his last employer and would have freshened up to start a new job role. But such aspects must not be discussed with the HR. Human resources expert Heath field mentions that, HR departments are ones who live in fear about lawsuits. When an employee shares such thoughts then he would be suspected of his motives and can be a tactic for menacing. The HR department can also take it in the other way that you’re threatening them too. For employees who decide to stay in good grace for the organization, it is good to avert such ideas and thoughts. There are situations which the employee faces where his or her spouse may be transferred to another location. The employee must make sure that unless they know for sure that their spouse is moving and the employee is also moving for sure, it is good not to alert the HR and say the complete story. In such scenarios the HR would look out for only fallouts and limiting aspects in the employee.When an employee shares such aspects the adverse effects would be that the employee would not get extra projects, they will not be promoted, many of the duties that the employee sees would be allotted to others. It is always good to avoid sharing your medical conditions which may disrupt workplace. It is advised to take time off or extended medical leave at times of bad health conditions. When health conditions are shared, the employer would only try to guard their work load, profitability and productivity as the absence of employees would affect the work place and productivity. Such sharing of thoughts may lead to missing chances of promotions, transfers, opportunities and team relationship. Crime aspects are other important scenarios which must not be shared to the HR when they are made clear. Events and other activities that take place outside workplace are said to be personal to the employee and that has nothing to do with decision making in an organization. When an employee makes use of a company vehicle and is caught for some crime activity then that may affect the workplace where the employee is working. Suppose an employee was in the accounting department and caught for malversating about thousand dollars, then there is more of risk even when it is said or not said. Background checks are done for the employees and when there is any felony, it is good to mention when asked which otherwise can lead to termination of the job. It is always advised not to share in detail about personal life aspects to the HR. There are employees who share about their personal life instances such as filed lawsuit against their friend, afraid of their ex-boyfriend, not spoken to sister for many years and so on. All these aspects can cloud the workplace opinion about the employee. Also the decisions made by the employer may not be known that he is making decisions based on what the employee has shared about their personal life. Do not share scenarios which make the HR team-oriented, cohesive and friendly. Employees may be reading bed time stories for their children and some may be enjoying the night in the bar, it is advised not to share any nightlife with the HR. This is because when an employee is not able to complete any assigned task after working hours, the HR may conclude the above, hence keeping personal aspects personal is required. Discriminating against religious beliefs is against the law and also the employee must not talk often about religion to the HR. Employees can possess religious beliefs but sharing it with HR can be avoided and also trying to convert other co-workers must be avoided as they may lead to termination of the job role. Talking about politics is another aspect which can alienate employees and hence it is good to avoid speaking about politics to the HR as well. When such political aspects are available there must be private information. Since the employee has too much of political affiliation, the HR may conclude that the employee is close-minded or open minded for any job role. Hence sharing political aspects to the HR can be avoided. There are employees who share their spouse income which is advised not to share so as the consequences may be higher. For example the spouse of the employee can be the CEO of a profitable organization. In such situation, there may be a co-worker who has an unemployed spouse. Since your HR knows the details, there are more chances for the employee to lose his promotion though qualified equally. This is because the HR may think that the employee does not need a promotion. Hence it is good to avoid sharing spouse salary and risk your career. These mentioned points are a few aspects which must not be shared with the HR as they may lead to contrary effects. Employees can get benefitted by reading this and controlling their emotions in sharing everything with the HR. HR are people who work for the profit of the organization, its productivity and success and anything that hinders the success of the organization is stopped by them. Employees must remember that there are few aspects and issues which must be discussed and some situations and thoughts which must not be shared with the HR. A good understanding of this by the employee can help him stay calm and protected in the job role.